The amendment also modifies §18-171, and requires dog control officers to investigate whether a dog is subject to classification as a dangerous or vicious dog upon receiving a report that a dog is believed to be dangerous or vicious. 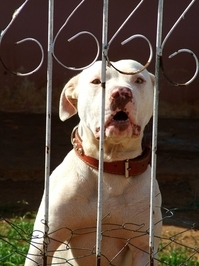 After a dog is designated as dangerous or vicious by a control officer, the owner is entitled to a hearing to review the classification of the animal. (§18-171(b)) Then, if the hearing board classifies the animal as dangerous or vicious, the amended ordinance imposes a duty upon the owner to obtain an annual, non-transferable certificate of registration. The certificate of registration requires (1) written evidence that the animal has received a permanent microchip inserted by a licensed veterinarian; (2) an insurance policy or surety bond in the minimum amount of $50,000.00, insuring the owner of a dangerous animal, and $75,000.00, insuring the owner of a vicious animal; (3) tangible proof that the animal will be confined in a pen; and (4) written evidence that the animal has been sterilized by a licensed veterinarian. Finally, §18-173 imposes a duty upon owners of dangerous or vicious animals to (1) post signs warning that dangerous or vicious animals reside on the property; (2) muzzle and restrain the animal sufficient to prevent the biting of persons or animals and prevent escape whenever outside the pen; and (3) make the animal and area of confinement available for periodic, unannounced inspections by the animal control officer. As discussed earlier, any failure to fulfill the four requirements of the certificate of registration, or properly secure the animal will give rise to a presumption of a breach of the duty owed to the victim, increasing the victim’s chances of recovering from the owner for their harms. While the broadening of the duty of dog owners is legally significant, the onerous certification and enclosure requirements in the amendment will also likely deter citizens from keeping potentially dangerous or vicious dogs and hopefully reduce the number of victims of such attacks. I have successfully tried dog bite cases in Court and am available to speak to you about your dog bite case. With my experience, I would be glad to speak with you at your convenience.Please note that the Law Offices of Kevin C. Ford is currently accepting dog bite cases throughout Georgia. If you or a loved one has been injured as the result of a dog attack, then please contact me immediately, as time if of the essence and crucial information and evidence needs to be secured as soon as possible.